However I really don't know how "to proof" his cheats. Should I film him during his matches? So he could say "it was not me, it was a cheater with my nick". And it's very hard to film his sprints in the desert at max speed with full backpack, or when he jumps and he doesn't die. I agree with you when you say that an accuse is not a proof, but if a whole community says that Dan Jirasek is a cheater I think that's a proof then. I really don't know how to proof Dan's cheats because he's a smart guy, but - as I said - the server is yours and you can do what you want. Last edit: 1 year 1 month ago by Rs_Funzo. I understand Dani and it is not a matter of not trusting you. Like I wrote I feel torn between my personal opinions and my role as an admin. If it were my server I would have already banned him but I have to consider other members and players. When we demand proof before we ban a player permanently I feel we need to use the same rules for everyone. I think it would damage the community (and goodwill) if we permanently ban based on accusations. With temporary bans I will accept lesser degrees of evidence. Yes proof would be video. Ideally we would be able to check at that same time with what IP Dan is playing. I understand it's hard. I would have no problem with giving you access to our RSC so you can monitor IP's. NL wrote: Yes proof would be video. Ideally we would be able to check at that same time with what IP Dan is playing. I understand it's hard. I would have no problem with giving you access to our RSC so you can monitor IP's. Replied by Gaza on topic Report bad players here! I would like to report the player 'ANY'. Everytime he plays he does a solo speed run through mission. I asked him why he always does this and leaves enemy behind that kill other players who join. 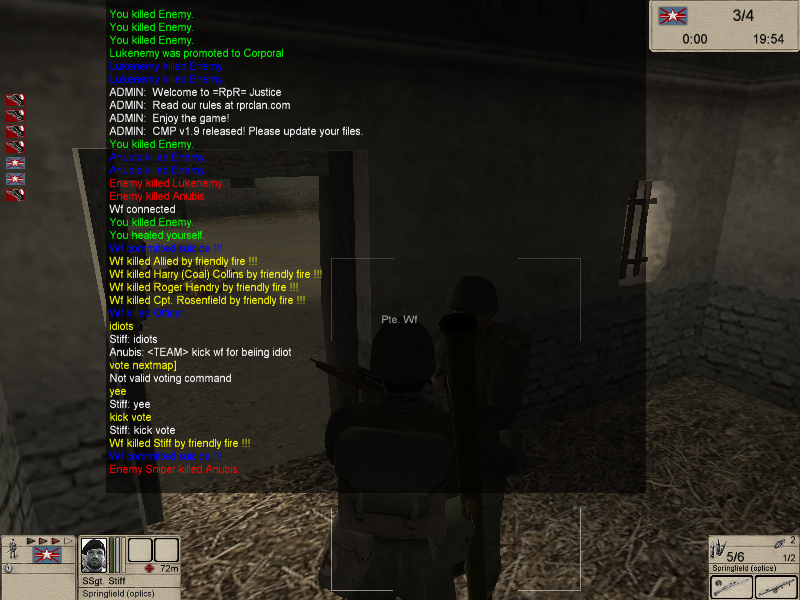 I then warned a player who joined, ANY said I insult him and I will be banned. Is this how the community is now? Please warn him or whatever. Replied by Nikita on topic Report bad players here! If you see behavior on our servers that you think is wrong or violates our rules, you must write a report here in this forum, but you must also add evidences such as screenshots or video recordings. Next time please think about it and provide sufficient elements with your report. There is no question of "believing" or "not believing" the person who makes such a report, it is simply, for the admins who must make a decision after this report, to have objective elements to decide. =RpR= admins can not take a sanction on a player without a minimum of objective evidences. Last edit: 1 year 5 days ago by Nikita. Replied by 43 on topic Report bad players here!